In a Coat of Arms, everything has meaning: the symbols, colors and placement all tell a story about the family it’s representing. 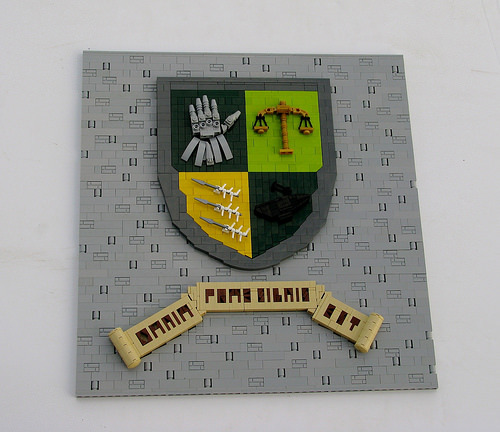 Robert4168 tells us the tale of the fictional Dratiphe Coat of Arms. He tells us the Gauntlet stands for strong and prepared, and the Scales for justice. The Anvil stands for honor, and the Arrows mean readiness for war. I love the sculpting and scale on all of the items on the coat of arms, and the scroll work is just lovely. It says, “Omnia Praesignis Est” and adds another level of complexity to the build.